We specialise in vehicle branding and car signage. Cars, vans, trucks, bakkies, caravans, trailers, busses, bulldozers…. We brand them all. 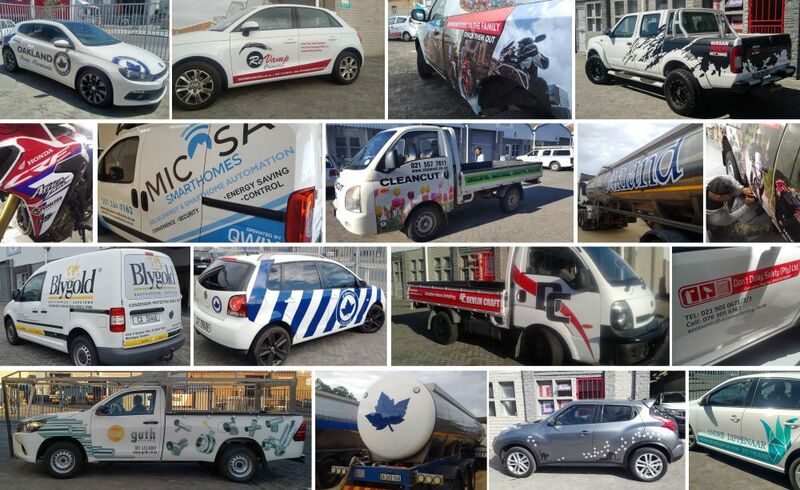 Whether you require full wraps, half wraps, decals, contravision or colour changes, you can have your vehicle branding done at Graphic Revelations in Montague Gardens, Cape Town. If you want to get noticed (gain awareness) and want your business or brand to stand out or make a statement, you’ve landed on the right page! Car signage is our business. If you’re a business owner, can you really afford NOT to have your vehicles branded? Think about it, free advertising everywhere your vehicles go. Car signage is one of the cheapest and most effective forms of creating awareness for your business or brand. The process of getting your vehicle branded is quick and painless. We measure your car or vehicle, take photos, do the awesome design, superimpose the design your photos, get your approval, prepare the vinyl, apply and off you go. To see more of our work , please visit our facebook page or our portfolio page. Was great meeting all of you, Just wanted to thank you for the brilliant work. It Looks Amazeballs, and not bad for my first attempt either I must say! Check out the attached pics! !